I may not have much experience in playground in a lot of other countries but there are some things that strike me about German parents and mums in particular and the way they supervise their kids and play with them (or not) at the playground. Come rain, snow or sunshine, kids will be there from dawn till dark with their parent. Most parents and families use it as a meeting place to get together with their friends. As school ends, the influx starts and they stay there for a while. I went to a nearby large playground this week and when I left at 5pm, the playground was still very busy even though it was almost dark. This is winter after all. Weekends are very busy too but in a different way. Sunday mornings are full of dads with the kids. Mums are busy cleaning the house or just having a little time off. Dads are on playground duty then. - kids will always be dressed appropriately. Now, this is a German characteristic not only true for the playground but for everything. If it is slightly damp or it has rained in the last 24 hours, the kids will be wearing a full-on rain set: boots, trousers and jacket. If it is under 10°C, kids are likely to be wearing hats, gloves and snowsuits. In the summer, if it is hot, it will be like a beach. Kids will be covered in sun cream on arrival and they will easily have nothing on apart from underwear to play in the many water features. Shoes are optional then too. And I mean tons. As they tend to come for a little while and not just pop in for 10 minutes or so, the amount of food is usually large. Whatever time of the day it may be, mums bring tons of snacks and food to be consumed while there: pretzels, fruits, biscuits, sausages, .... you name it, they have it somewhere in the bag together with a bottle of something to drink for each child. Most families bring a large if not a few large bags with sand and water toys, all carefully labelled with their child's name (ah German planning!). 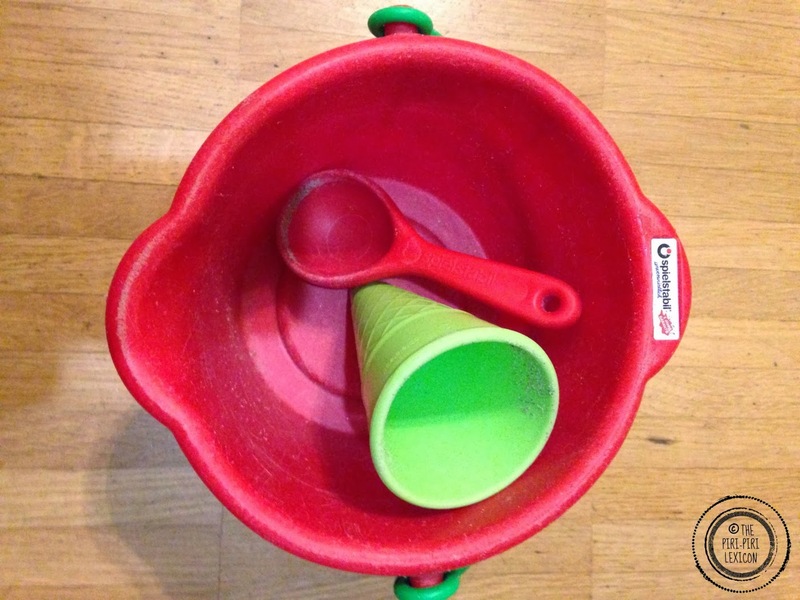 Buckets, spades, ice-cream cones, spoons, trucks, etc. Older children tend to come on their bike and younger ones in a pushchair but some also bring the bikes or ride-on toys too, just in case... Pushchairs often have small bikes mounted on and mum can hardly see where she is going with all the gear. Finally, let the kids do anything you like as long as you can chat with your friends in peace. I suspect this may be true in most countries. But German mums allow their kids a lot of freedom. I was surprised at the beginning to see older kids climbing on the rooftops of the structures (which are not really meant for that). I think this may come down to their attitude to safety too. the things Germans let their kids do in the playgrounds will never cease to amaze me. Needless to say, I was not really prepared for all this and my poor little girl with her lonely mum, no rain trousers, her apple, her spade and only her legs to transport her was the odd one out at the beginning. I now understand the rules and she has her own collection of toys (even if it not labelled and much smaller than most others). I also arrange playdates there to blend in! I would love to hear your comments. How different is your experience with playgrounds where you live? How involved are parents? Is there a ritual behind playground activities? Hi! Here, in Barcelona, the park etiquette is very similar, but we don't usually like to be barefoot in parks because it's not safe (slippery or even dangerous because of any object you can find! ), and we never bring sausages! Ha, ha We usually have fruit, sandwiches, biscuits, juices... Generally speaking, if it rains, we leave the park and go to a cafeteria or just stay home. No rain will stop the Germans from going out! Ah! Playgrounds in London close at 4pm in the winter, which is a bit of a shame. During the week it's hard for your kids to get there because they get out of school usually around 3:30. And, they start school at the age of 4 (state) and 3 (private) so they really still love playgrounds. Playgrounds close! Oh my.... this would never happen in Germany. In our neighbourhood there are mainly houses with yards, so children go to the playground when it is nice outside, or during holidays. Otherwise, we don't have to go to the playground when we need air, we just go outside in the garden. S there's that. And then, we've got many foreigners around, so the toys are not labeled, but we do bring a big bag of sand toys, so that we can chat or do whatever we mean to do while the children tend to their business. Yes, supervision is minimal, unless the presence is required, for example both my children want to go on the big slide, and they can if I am there to make sure no one cuts in front of them (I hate this, both that I have to say it and to actually say it), if there are few people, they can climb up and slide down by themselves quite alright. I find the German approach to clothing children very reasonable, and sensible. It takes a bit to gear up when leaving the house, but when we get back, stripping down the clothes is done in a jiffy, and I can stowe away the dirty clothes and take care of them later, when I have the time. Germans love being outdoors, which is again, quite sensible. And children spend loads of time outside as well, which is also great. There some things that I do not do 'the German way', but overall, I have to say, they have managed to find a balance between protective and fostering independence in their parenting. I think my mum would have gone mad if she was exppected to be at the playground with us for long enough to need snacks! I took my brother to a playground last summer. I think we stayed about an hour, then he wanted to go home because he was too hot. Staying at a playground even an hour is crazy! Unless you are going with a group of friends, spending 20-30 minutes at the park was a loooong time. That is excepting the times we decided to go around lunch time and eat at the picnic tables... then we might have made an hour... Of course, I lived in the suburbs where the backyards were at 2-3 times as large as the first floor of any given house. A house with children was pretty much guaranteed to have a swing set (consisting of swings, a slide, a sandbox, often a built in club house and monkey bars, etc. ), and a good number had pools. Also, at least half the houses would have school-aged children, so most kids would find suitable playmates within a three or four house radius and (since the park was a whole three blocks away) would simply play in one of their back-yards). That was in the summer and late spring/early fall. In the winter we played inside or hibernated. Hibernating is fun, lol. Gotta love the Midwest. Can I come visit you in Germany :) Wink Wink. This looks absolutely amazing. The "german way" sounds divine! Interesting! I try to be prepared wherever I go but I bet I'd look unprepared at one of these parks! I love reading everybody's experience from around the world... Keep them coming. I love Dads in the park Sunday morning!!!!!!! Annabelle, I would love to hear about French playground customs, especially since I am hoping to travel to France with my family for the first time this summer! We love checking out new playgrounds when we travel. I actually did a post on it (link below) because it's such a great way to meet people, get local recommendations and introduce kids to different cultures under the guise of playtime. 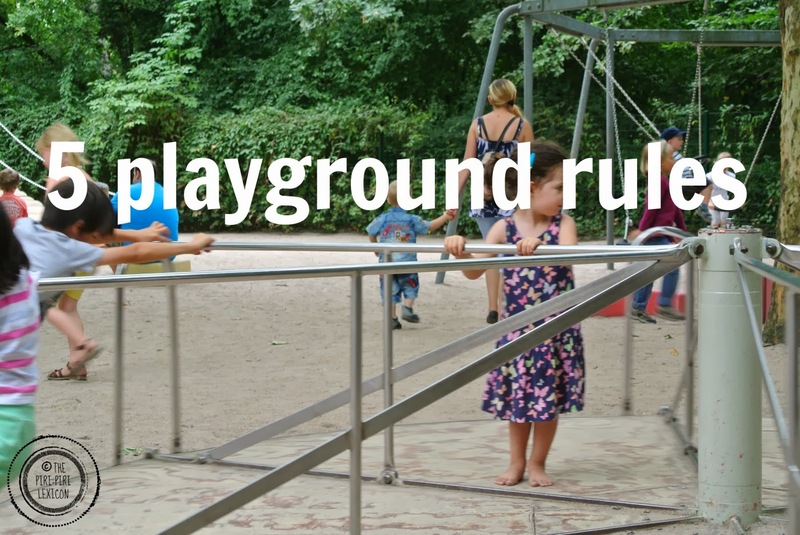 Thanks for the rules for German playgrounds. We'll be sure to adapt as many as possible on our next trip there!!! I love the playgrounds here in Germany. I loved too that the playground is empty until After Lunch/ naptime. When my little one was just learning to walk and just gaining confidence climbing, I didn't have to worry about him getting bumped by bigger Kids. In the afternoons though, Its definitely a moms Club atmosphere. I have just been camping at a holiday park near a beach in Christchurch New Zealand. There is an eco nature playground with trees and sand and a water pump swings slides all made to look natural and all surrounded by tress and flax grasses. In the huge sand area the children dig rivers the water pump fills ...we loved it...nice and cool on hot day and messy play is the best. I was sad to over hear a grandad tell his two grandchildren to get out of the sandy water as its getting there nice clothes dirty and they might get sick (the children were loving it) another child fell off a platform and i overheard his parents saying it wasn't safe and they took him away...very sad.